Ok, I make this and one or two other desserts – and no more – desserts aren’t my ‘thang’. However, Mark will beg to differ! It’s just sleight of hand! He thinks I can cook anything! Give me something savoury and I’ll agree with him! Desserts are another animal entirely…. This is messy, but easy! (messy as in it uses just about every bowl you have in the kitchen!) The beauty of this recipe is that you don’t have to be precise for it to work! You want more chocolate? You just go ahead! 1. To make the pastry, rub the butter into the flour until the mix resembles breadcrumbs. Sift in the cocoa powder then add the sugar and enough of the beaten egg to bind the mixture together. Knead lightly, wrap in greaseproof paper and chill in the fridge for 20 mins. 2. On a lightly floured surface, roll out the pastry and use to line a 20cm (8 inch) fluted flan tin. Cover the bottom of the pastry case with the marmalade. (The pastry can be quite ‘wet’ so if you have to make a jigsaw with the pastry, that’s fine – just gently smooth the pastry pieces into the main pastry case. Evenly drizzle the grated ginger over the marmalade. 3. Peel the pears, cut into quarters and remove the cores. Arrange them in the flan case. 4. Melt the chocolate and butter together in a bowl over a saucepan of simmering water. Do not let the bottom of the bowl touch the water. Set aside to cool. 5. Preheat the oven to 180°C/350°F/gas mark 4. 6. Beat together the egg yolks and sugar until pale and fluffy. Fold in the chocolate mixture. Whisk the egg whites until stiff, then fold into the mix. 7. Pour the mix over the pears as evenly as poss – use a spatula to very gently spread it about. You don’t want smooth, just mix to the edges at least!. 8. Bake for about 30 mins, until firm to the touch. Serve hot or cold. Enjoy with some Sagrantino Passito! « A Fantastic Gusto Sunday! A day in photos. Giselle, after I have tried your delicious strawberry and chocolate tartelets I almost eat the screen seeing the pear tart. 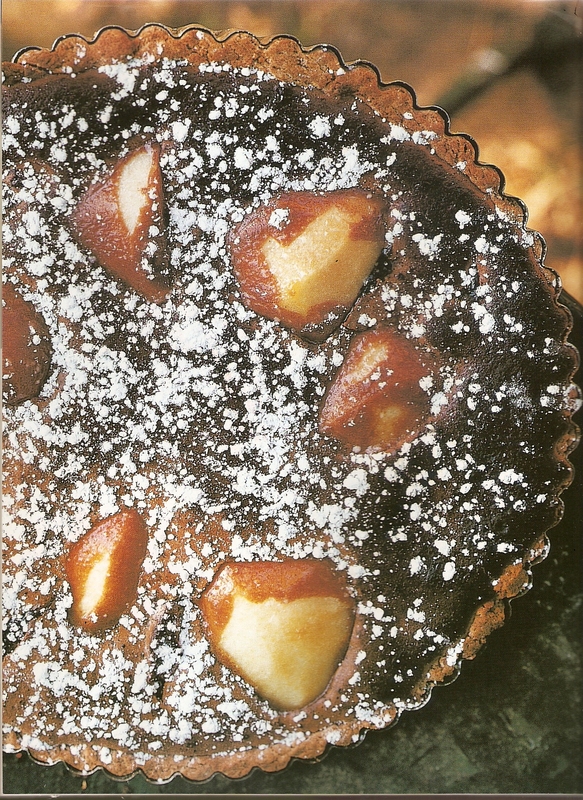 This is one I am going to make before the pears get of season! Ah yes I’d forgotten about the strawberry version! It WAS good, wasn’t it! Enjoy making the pear one, it’s so delicious, you’ll be making it all the time! Of course you could always experiment with the fruit once the pears go out of season! !